Will Khloe Kardashian be the first sister in the family to follow the “K” tradition? According to reports, Khloe is considering the possibility of giving her child a K-name. A fan on Twitter asked her about the upcoming baby, and the reality star responded, “I think a T but a K is an option as well. That’s as far as I know.” Perhaps, the child’s name will honor the first letter of both of her parents? Back during the season finale of Keeping Up With The Kardashians, Khloe expressed shock over the fact that she wouldn’t be having a boy. When chatting with Ellen DeGeneres on her talk show, Khloe claimed she was considering naming the baby, “Tristan Junior,” if it was a boy, but if it were a girl, she wouldn’t have a clue where to start. 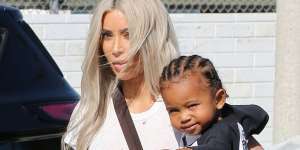 She emphasized the importance for the child to become friends with Kylie and Kim’s children, Chicago, and Stormi Webster. As it was previously reported, Kim Kardashian West and Kylie Jenner both welcomed children into this world this year, with Kim saying “hello” to Chicago via surrogacy, and Kylie giving birth to Stormi Webster with Travis Scott. Fans of the Kardashian-Jenner clan know every other young kid in the family including Kourtney and Rob’s children have had different sounding names including, Penelope, Reign, Saint West, Dream, North West, Chicago, and Stormi. Mel B Reveals Her Ex Husband Stephen Would Show Daughters ‘ISIS Beheading Videos’ - Traumatized Angel, 10, Is In Therapy!